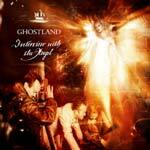 Ghostland is the trio of John Reynolds (producer-writer-programmer), Caroline Dale (vocalist-cellist-lyrical string arranger) and Justin Adams (guitarist). They have worked with everyone from Oasis to Bjork and from Sinead O'Connor to Simply Red. This is their second album and it must be the most exciting album they have made in their careers to date. on 03 & 04, uptempo pop tunes with the technofied acoustics. on 02, soft and beautiful ballad. on 09, atmospheric and melodious tune. on 10, atmospheric and beat-heavy tune. 07 & 12, soft and beautiful ballads.